I’m trying to study some stuff from Vinnie’s Meltdown record. In this record he moved away from the classic 3 notes per string shred and adopted a “Blues player on steroids” style. A lot of the fast licks in this record seem to be based on the blues scale and hybrid picking (and also Mixolidian tones here and there). I was wondering if anyone is aware of what are the basic techniques/cliches of this style of playing. For definiteness here’s a video of Vinnie demonstrating a few ideas of this type. If anyone is aware of what he is doing in detail and wants to share, I’d be very grateful, I think this sounds killer! It’s basic chicken pickin. Downstroke with the pick, upstrokes with the middle and ring finger. Here’s a clip of my using that technique, not the best angle but you can see my middle finger doing some heavy lifting there. Try this lesson, you can’t escape getting the basic motion down, typical track would be working man blues to get it feeling natural. When I hybrid pick I do it with my middle finger. I uploaded a video for you, I guess that I hybrid pick when there is a single note on a string - I had to really think about what I was doing as I play hybrid so much that I just do it without thinking about it! 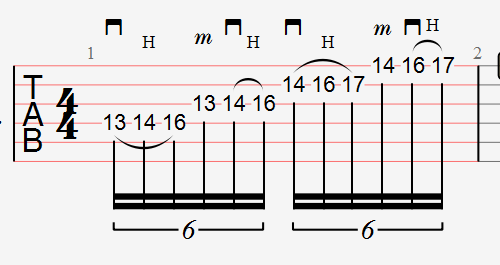 I’m also using a lot of legato to help me and I have added in an example below of what I would do with my right hand when hybrid picking. The nail on my right hand is short and I’m doing all this with my finger tip. I do use the middle finger to pluck the occasional isolated note, typically when I can’t find any other solution. But I haven’t got any proper Blues/pentatonic vocabulary that uses this technique. Working man blues seems a great starting point actually, thanks for the tip! Once I have a few hybrid-blues cliches down, it’ll probably be easier to decode Vinnie’s pentatonic madness - or at least I’ll be able to write some vaguely similar licks! Nice Tommo, get reddy to grow a few calouses, it may hurt but keep going. The pain stop after 5 seconds of starting to play once they start, in a week or two you’ll be fine for good. once you start hybrid picking you wont even realise you’re doing it, it will happen that naturally.